In a recent comment in talkRA.com, Alan Gonzaga has asked a question that I feel somehow points to the core topic of discussion in my earlier posts viz. Managing ‘Cost’ must be an integral part of telecom Revenue Assurance and Assurance : Management : Maximization & the scope of the activities. I believe that the scope of “Revenue Assurance” per se is about ensuring checks and controls (including continuous monitoring and future prevention) of any activity that has the potential of affecting top-line revenue of the company; and add to that the necessity of managing costs as the most integral part. No point in saying I have assured top line revenue when I have made sky-rocketing expenditure. I would thus intend to mention the scope of work as ‘Risk Management’ in operations. 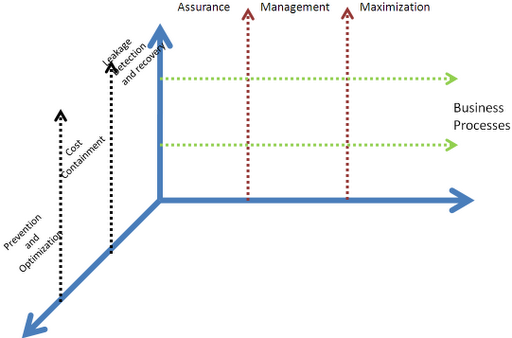 The grey boxes represent the working domains within the verticals of ‘Assurance‘, ‘Management‘ and ‘Maximization‘ and the horizontals of ‘Leakage detection and recovery‘, ‘Cost Containment‘; and ‘Prevention & Optimization‘. Note: There is no particular order that the numbering follows. ‘Over Charging‘ has the after effect of creating a situation where customers would churn away thus causing potential damage to the top line revenues. In a digital age where information flows at the speed of thought, creating angry customers who would be happy to avenge by announcing their pains in social web could effectively have a cascading effect of having a large number of customer dis-satisfied. Thus managing customer’s experience is vital form of preventing future losses and thus makes up the box number 1. However, over-charging is a situation that should be avoided and not ‘faced’. The way to avoid the same is by ensuring proper configuration checks in the rating and billing systems. 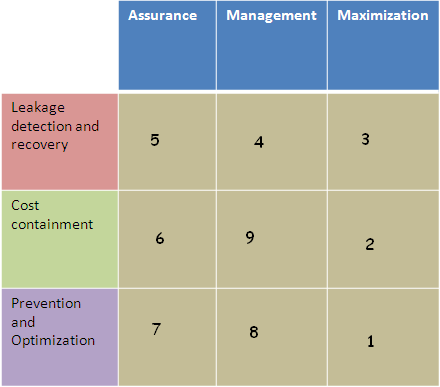 This forms the part of activity of box 7 (Assurance + Prevention & Optimization). Hence my understanding says ‘Over Charging’ is definitely a part of ‘risk management’ and this is because of the fact that the boundaries of conventional “RA” is way to porous than is conventionally conveyed for all the ‘commercial‘ reasons. Effectively the scope of risk management in telecoms could possibly be visualized in the following 3 dimensions as in the diagram. Effectively I find it not particularly correct to use the term ‘revenue assurance’ and then have porous boundaries across the tasks. Instead i personally find it easier to qualify the tasks in the 3D structured mesh under the hood of ‘risk management’. This is an open forum and all your comments both for and against my opinion are welcome. This entry was posted in Revenue Assurance, Risk Management, telecom. Bookmark the permalink.